Alana, a young girl living in the year 3000, is shocked to discover that her guardian Tulista is to be sent back in time 500 years to try to discover the causes of the "Great Disaster" which nearly destroyed all life on the planet. Tulista tells Alana that she will be gone for 28 days but it will only feel like a few seconds to Alana. Alana gains entry to the restricted time laboratory to watch as Tulista is hurled back in time only to reappear seconds later, this time as the hostage of a sinister warrior, Silverthorn. When Tulista breaks free, Silverthorn takes Alana as his hostage and escapes back in time. Alana emerges from the time capsule to find herself lost in a strange world — the 1990s. Jenny pushes Alana out of the way of the oncoming bulldozer, but Alana is knocked unconscious in the process. Jenny leaves to find help, and when she returns later that night she finds Alana watching a hologram on PJ, her wrist computer. Jenny finally believes that Alana is from the future. She invites Alana to stay with her family at the deli. Jenny's mum, Irene, finds the girls hiding out in the treehouse watching another holographic projection. 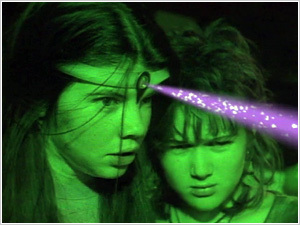 Unconvinced Alana is actually from the future, Irene allows Alana to stay the night in the house only to walk into Jenny's bedroom and see Alana using her Transducer headband to levitate a doll. Alana is surprised and loses concentration, causing the doll to explode. 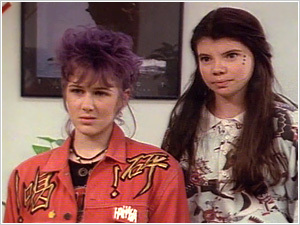 Irene takes Alana and Jenny to Jenny's high school, telling Alana to pretend that she is Jenny's cousin from the country. Alana is introduced to Jenny's teacher, James, who is astonished by Alana's knowledge, as she constantly corrects him in class. 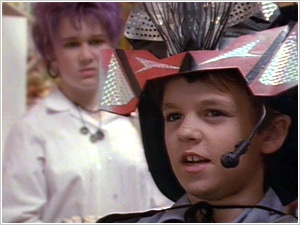 Meanwhile Jenny's little brother Petey steals Alana's transducer to challenge the school bully and his gang to a fight. Jenny and Alana race to Petey's fort, arriving to see an energy bolt erupt from the transducer and blow the fort up. As the kids start to head home, Silverthorn arrives in a limousine and kidnaps Alana. After telling Alana that the time capsule is buried in the dump and gone, Silverthorn explains to her his plan to control the world — but he needs her transducer. With Jenny's help, Alana escapes, taking a printout Silverthorn had in his possession. The girls return to Jenny's home, and after an elaborate explanation for where they've been, Alana has Jenny destroy the transducer to keep it out of Silverthorn's hands. The next morning, Alana recognises the front page of the newspaper as being identical to Silverthorn's printout. She realises that Silverthorn still has the time capsule and is using it to find out what is going to happen in this world before it does ̬ and making a tidy profit. If Alana can find Silverthorn, she can find the capsule. With: Doreen Warburton as Mrs Bloomington, Haydon Samuels as Greg, Dene Kermond as Greg's Mate, Adam Cockburn as Greg's Mate. During computer class, Alana uses PJ to trace the registration number of Silverthorn's limousine, and finds it registered to a company called Futures Incorporated. Alana and Jenny visit the offices of Futures Incorporated after school and hide away until after closing to try to find Silverthorn's home address. Alana is caught when Silverthorn returns but she tells Silverthorn that the time capsule will automatically return to the year 3000 in 28 days time, and asks to be allowed to return to her own time. 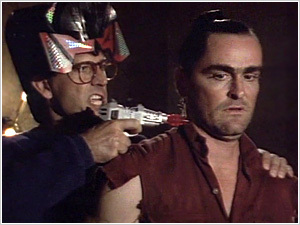 Silverthorn is outraged that he could lose the time capsule but he collapses mysteriously, allowing the girls to escape. Petey attaches a can of paint to Silverthorn's car so that it leaves a trail allowing Jenny to follow his limousine back to his house. Skipping school, Jenny, Alana, and Petey break in and overhear a meeting between Silverthorn and a politician to whom he boasts that he can make him the most powerful man in the country. To prove his knowledge of the future, Silverthorn reveals to the politician that a disastrous tidal wave will hit the coast of Japan the next day. When the two men leave, Alana finds the time capsule behind the bookshelves in Silverthorn's library. Alana tries to use the capsule to return home but it won't let her leave for another 13 days. Alana tells Irene and James about Silverthorn's prediction of the tidal wave. James calls a reporter with the story, but the reporter doesn't believe him. However, after the tidal wave occurs, the eager reporter comes to the deli with a film crew in search of a story. Alana uses the Transducer to try to prove to the reporter that she is from the future. After seeing the story on television, Silverthorn is dismayed to hear that there will be another news report on Alana the next night, during which she will reveal details about a man from the future with plans to control the Earth. Later that night a dark figure enters Alana's bedroom and swaps the Transducer for a fake. Alana appears on national television to demonstrate her Transducer before a group of experts but when it doesn't work, Alana quickly realises that it is a fake. Watching on tv, Silverthorn is thrilled to have discredited Alana but when he tries to uses Alana's transducer, he is unable to control it. A police officer and a representative from the Department of Welfare arrive at the deli. They take Alana away, saying that she is a now ward of the state until her background can be sorted out. After arriving at the Home for Girls, a warder tells Alana that her guardian has arrived to take her home. Alana walks into the warder's office, expecting to see Irene and Jenny, but is instead greeted by Silverthorn. 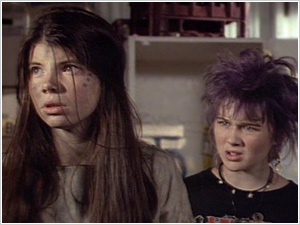 After bringing Alana back to his house, Silverthorn tells Alana that he has a brain tumour, which she must cure with her Transducer if she wants to return to her own time. Realising Silverthorn has taken Alana, Irene and James take Jenny to see him. Silverthorn concocts an elaborate story about his troubled "daughter" Alana and even has Alana admit she has been lying all along. Only Jenny refuses to believe Silverthorn's explanation. Having successfully cured Silverthorne, Alana tries to return home only to find that Silverthorn has constructed a force field around the time capsule to prevent it from being used. The next morning, Alana spots Jenny watching the house and is able to smuggle her wrist computer PJ to Jenny by attaching it to a remote controlled car. Jenny takes PJ back to the deli where she shows her mother Alana's holographic message pleading for help. After showing the message to Mr Rooney, the three, with Petey secretly following along, break into Silverthorn's home. Following a desperate struggle, they rescue Alana and drive back to the deli with the time capsule strapped to the roof of the car.